My name is Maria Movsheva, and I am a freshman (Class of 2019) majoring in Art History with a possible minor in Mathematics. I have previous experience working with conservation of historic objects – measuring dimensions of rooms and their features in a 19th century Moscow villa with a Conservation workshop of South-Eastern Moscow. I plan to utilize my visual arts skills and passion for history of art and Mediterranean world in accessing the Fayum portraits. So far I know of two ways of studying works of arts – by reading about them and by re-creating them. I hope that this course will give me the third method – by handling artifacts with one's own hands. Portrait of a Man shown in visible light (left) and visible induced infrared luminescence (right). The bright white glow on the background and in spots on the tunic indicate the pigment Egyptian blue. The class started with the week’s readings – L. Spaabaek’s “Conservation of Mummy portraits at the Ny Carlsberg Glyptotek” and M. Cannata’s “Funerary Artists. The Textual Evidence.” Learning of the panel conservation efforts of the 19th century archeologists, we were at first appalled by W. Flinders Petrie’s conservation strategy: heating up the existing wax on the portraits in the attempt to return the paintings to their original luster, or adding new paraffin wax on top of them. We discussed how conservation and technical analyses have changed over time – in the 19th century, researchers took large samples out of the artifacts to test out materials’ composition and properties, but now, this can be done without damaging the object using several new methods, including ones we are studying. From Cannata’s “Funerary Artists”, we learned that the artists of Roman Egypt were from lower economic classes, and that they joined professional guilds to reach more clients, to be exempted from material tax and to raise their social status. We also understood that the materials required for painting—including pigments, for example—could have been provided by the client, or the artist could have been reimbursed for the cost of acquiring what they required. Cannata also points out that while painting of mummy portraits was more likely completed by people with Hellenized or Greek names, the work of actually preparing the mummy was completed by priests with more Egyptian names, and was possibly carried out by indigenous Egyptians. Before starting our work, we looked at some of the raw materials used in mummy portraits. We saw two bags of natural beeswax– bleached and unbleached. This is the basic material used in encaustic. The bleached wax had a light yellow color while the unbleached wax was golden yellow. The unbleached wax had a stronger and more natural smell. It is believed that Egyptians bleached their wax by boiling and putting it out in the sunlight. We also examined two bags of gum Arabic—also known as acacia gum—which is the exudate from acacia trees which were fast-growing trees present in ancient Egypt. The natural state resembled reddish-orange translucent crystals while the ground gum arabic was white colored and felt starch-like. This gum was used extensively in ancient Egypt and has been as one of the binders for paints and ground layers in mummy portraits. We also used it in our own recreations of portraits. For the rest of the class, we went back to study our multispectral images from last week. We were still excited about the Ultraviolet Light Induced Visible Luminescence (UVL) images where the pigment madder lake glows a rose color. On the Portrait of a Man, we found madder lake on the nose, mouth, cheekbones, clavus (or stripe in the tunic), and neck. We also looked to see if the Infrared Reflected Image (IRR) showed us any trace of an underdrawing visible beneath the paint layers, and we think that the Portrait of Man might have one on his left eyebrow that measured out it’s thickness. However that is the only visible underdrawing. This made us question whether the artist very skilled in depicting individuals or was the face composition so similar to others he painted at the time that it was easy to render? The pigment madder lake appears a bright rosy red in ultraviolet light induced luminescence (UVL). You can see that his nose, cheeks, eyes, and garment were all painted with it. The blue glow around the portrait comes from the modern optical brighteners in the paper board frame that the portrait is glued into. The most interesting observation with the Portrait of Man, however, was the presence of Egyptian blue. 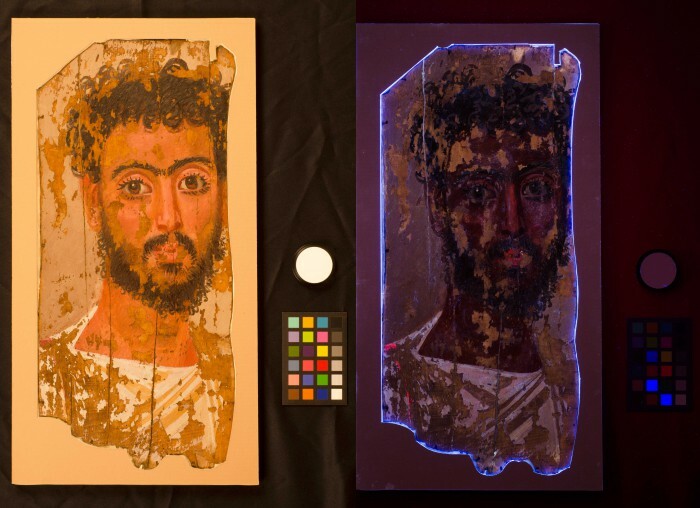 We were confused as to why we didn’t see this in the image from last week, but after re-shooting the Visible Infrared Luminescence (VIL) image, we saw that the entire background of the image glows, suggesting that the background is a white paint mixed with Egyptian blue! So even though the background looks gray in normal light, it might once have looked a little more like a light blue color. We also now noticed white spots of Egyptian blue on the man’s tunic in VIL; under the microscope, we found small spots of a dark blue pigment there even though the overall tunic looks bright white. We know from our readings that Egyptian blue was sometimes added to white to brighten it up—is this what is happening here? The Portrait of Young Man also has traces of Egyptian blue pigment as well – but not clearly visible in the background. However, it does seem to show up mixed in with the madder lake on the clavus of the tunic, making that stripe more purple than pink. Here, too, we see small blue particles mixed in with the madder lake under the microscope. We can’t wait to find more! Awesome post Maria! I love the way you describe the mystery we faced surrounding our search for Egyptian blue because I think it really helps explain the excitement in the field overall about this cool pigment! It’s always interesting too when we get different results in our research for the two portraits because it helps us note more about the portraits as a practice. It was so cool to see that the portrait of the man actually had Egyptian blue on it after reshooting the image! There’s so much of it in the background that it’s weird to think it may have gone undetected in our first image. Is it possible that the portrait of the young man may also have Egyptian blue in the background that we just haven’t found yet? Great article! Good post Maria! The readings for this week were intriguing because of the greater context they gave to the artist, something we had not previously really studied. These portraits are sort of a portrayal of two people, the man/young man and the artists that created them through their own unique style. I was personally surprised to learn that patrons often paid for the materials used by the artists and that there is evidence that the artists worked from their homes. Also finding the Egyptian blue was very exciting due to how infamous the pigment became in our class. I hope in the future we can find out more about the artist such as the types of tools he may have used and maybe we will even find a brush fiber. It was such a exciting discovery of Egyptian blue particle! And as Maria mentioned, the “conservation” strategies adopted by Petrie are truly mind striking. But the evolution of conservation also brings to our mind we need to be very aware of the conservation work done on the portrait and differentiate what are authentic and what are relatively modern. Great job Maria! I think it’s great how definitive our knowledge of the presence of certain pigments, specifically madder lake and Egyptian blue, is. It really makes me feel like we’re moving in the right direction in our investigation of the mummy portraits. Great post, Maria! Great article! During my independent research, I have started to look into the possibility of the blue found on the Portrait of a Young Man. What I have found is that there seems to be chunks of blue similar to that of indigo. I compared what I saw on the portrait with our paint samples, and am now confident that what we have is indigo, which would explain why the Portrait of a Young Man does not glow in our VIL image as much. It was so exciting to see the Egyptian blue particles under the microscope! It was really interesting how you could actually see the different fragments of the pigment mixed into the white! 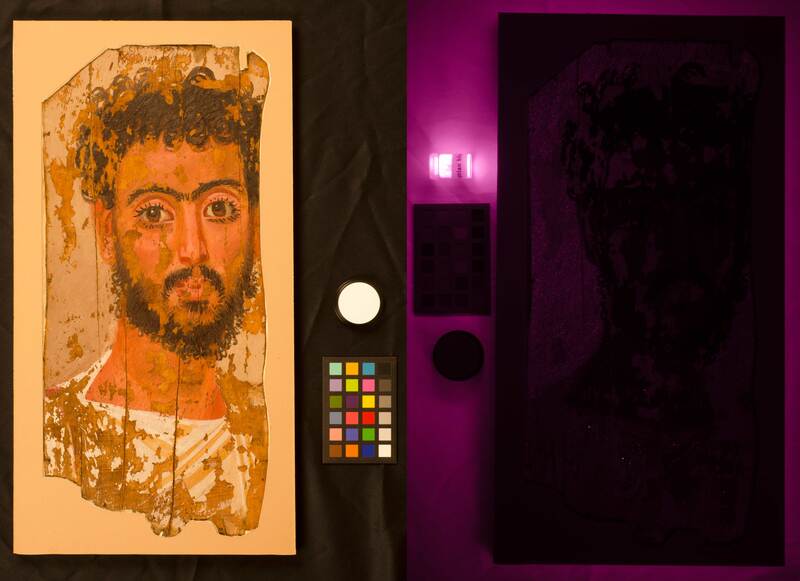 After our recent trip to the Walters museum, where we discussed the presence of Chromium in the purple found on their mummy portraits, its unfortunate that our own portraits did not show evidence of chromium when we conducted X-Ray fluorescence. Had their been a minor or even trace peak of Chromium it would have opened the door for even further research on the clavus found on young man. Great post Maria! The eerie glow that the Egyptian blue gave on the Portrait of a Man was so intriguing, and when I did my independent research on the Young Man, I hunted for similar traces as well and was thrilled to see some on the background as well! I’d love to identify what types of other blue pigments were to used to ensure that what we’re seeing is indeed Egyptian blue. I am so fascinated by the Madder Lake found on the Portrait of the Man. Even though there was Madder Lake on the Portrait of The Young Man, the way it is distributed on the man and how it stands out is really amazing. I’m also excited about all the Egyptian Blue and glad we caught that blip! Week 7–Guess How I Looked?